This week, in memory of Yitzhak Rabin, my husband and I went to see a biopic of his life. The film, Rabin in His Own Words (by Erez Laufer) was a compelling and insightful documentary film. 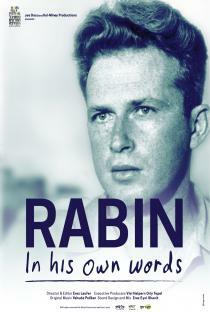 It covers both Rabin's private and public lives and begins with his childhood and the early period, including his early days in the Palmach, his military service in the IDF, his political career up to and including the Oslo Accords. The entire narration is from Rabin's interviews, speeches and letters, which is quite a remarkable feat, and the visuals include wonderful family photos and very special archival footage. In my husband Ron's review of the film on his blog for the Times of Israel , he wrote that "This was one of the most beautiful and inspiring Israeli documentaries that I have ever seen, and I was very moved by it. It was personal, poignant and professionally done." For the complete review see his blog. The film offers a loving portrait of the man, but it doesn't hesitate to grapple with difficult issues, including the forced evacuation of the Arabs of Lod during the War of Independence, his 24-hour panic attack prior to the Six Day War, and his wife's bank account in Washington DC which was the trigger that forced him to resign after his first period as prime minister and which opened the door for the Likud to win the ensuing elections. More importantly, the film covers the man's greatest achievements, including his intensive work with Kissinger, during the period of shuttle diplomacy, to pave the way for peace with Egypt, and the tremendously brave step he took in signing a peace agreement with Yasser Arafat. With hindsight, many might belittle the Oslo Accords, but it is clear that this is what permitted Rabin to conclude a peace agreement with Jordan and opened the door for the Vatican to finally formally recognize the State of Israel. The film, which won an award for "best film" at the Haifa Film Festival, still has many upcoming screenings at Cinematheques around the country. I highly recommend it! Rabin in His Own Words (documentary, 112 minutes) is distributed by Menemsha Films.